Furnace RED TAG is a warning label issued but your Heating Contractor or Fuel Distributor (ex. Enbridge) to an unsafe fuel burning appliance. RED TAGS come in two categories. "TYPE A" and "TYPE B". TYPE "A" Furnace RED TAG : Appliance or Work is an Immediate Hazard. 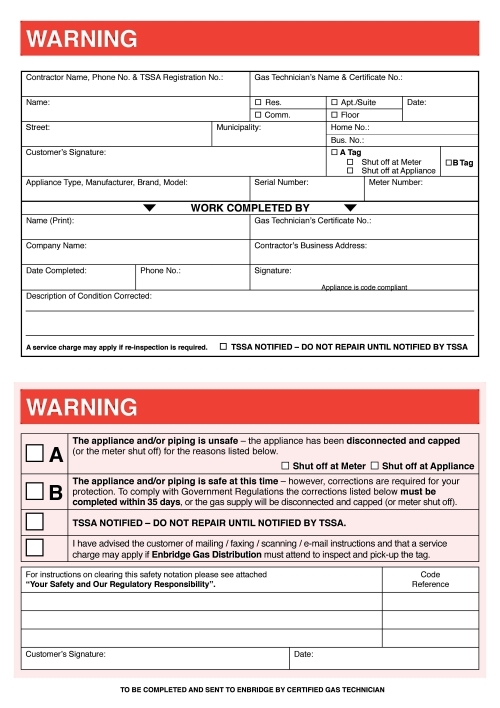 When a certified gas technician finds that an appliance or work is in an unacceptable condition that constitutes an immediate hazardous situation, he or she must immediately shut off the supply of gas to the appliance or work, complete the RED TAG, affix it to the appliance or work, and send a copy to your local Gas Distributor within 14 days. For Example : Cracked Heat Exchanger, Defective Heat Exchanger, Unsafe Gas Piping or Venting with Immediate Hazard. TYPE "B" Furnace RED TAG : Appliance or Work Does NOT Constitute an Immediate Hazard. 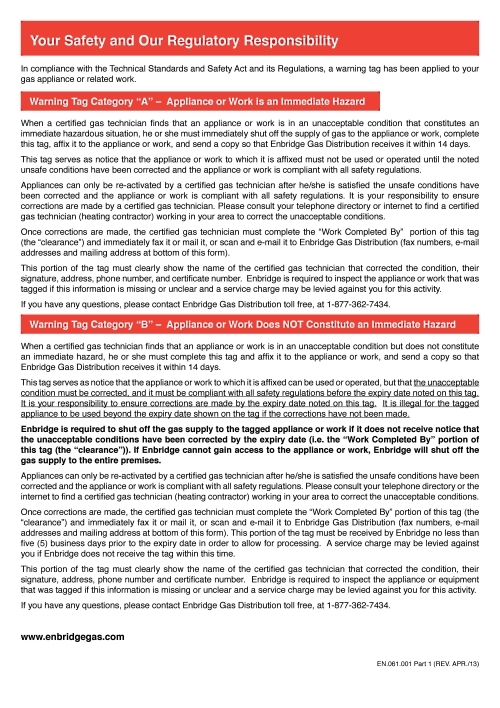 When a certified gas technician finds that an appliance or work is in an unacceptable condition but does not constitute an immediate hazard, he or she must complete the RED TAG and affix it to the appliance or work, and send a copy to your local Gas Distributor within 14 days. For Example : Unsafe GAS Piping with no Immediate Hazard. What Should You Do if You Have Received a RED-TAG? When you receive a RED TAG don't panic. Call us for your RED TAG at 905.707.1299. We will repair or correct the fraction and fill up and send your RED-TAG to Enbridge.